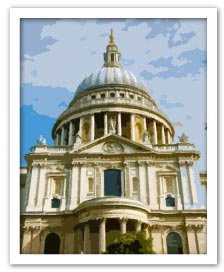 An important and historic part of London, St Paul's sits in the area known as the City of London and was established in around AD50 after the Romans invaded Britain. Sitting at the highest point is the magnificent St Paul’s Cathedral. Designed by Christopher Wren, the Dome is among the highest in the world and has dominated London’s skyline for 300 years. The oldest part of London is a great choice for one of our exciting events. Browse our treasure hunt section for inspiration or why not take part in an exciting cooking event in a venue near by? We also have a great range of Musical and High Tech events to choose between! With over 20 years experience organising and running award winning team building events in St Paul's, our friendly sales team are on hand for all your event needs! Give them a call on 0845 006 06 06 for more information or complete a quick enquiry form.